At the end of last month Jen left again for a work trip. This meant, of course, that I would have late night events to attend downtown which wouldn't bring me home until late at night. It's a strange phenomenon that has developed where I only ever have to go downtown on days when it is impossible for Jen to pick the boys up from day care even though with her new job she is available to do it nearly 100 percent of the time. This also meant I got a full daddy day with the boys and that Martin would exercise some newfound independence by taking off all his clothes and his diaper and eating dinner in the buff. An exciting development is Jen's mum letting me borrow her electric griddle so I could mass produce some pancakes for the boys who now eat them at an alarming rate. I don't know how this piece of kitchen gagetry has evaded me for so long. This has made a task I hate into a task that is actually quite enjoyable. 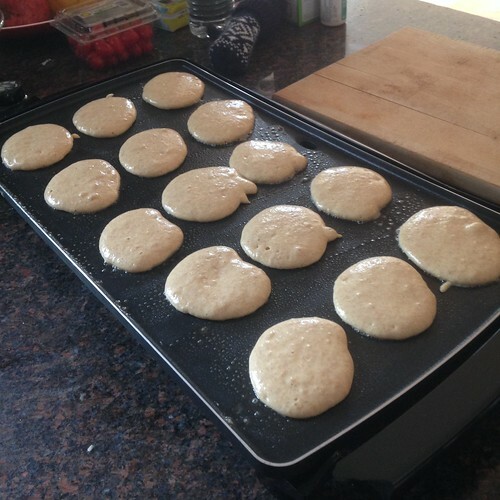 The griddle offers a lot more control and even cooking than our terrible, horrible, no good, very bad electric stove. After making a sextuple batch of batter I was able to easily make and freeze several bags for quick defrosting in the morning. As a special treat for the boys I made placemats for them thinking that this would make after dinner cleanup a little easier. I was wrong, but elliott enjoyed his Jake and the Never Land Pirates placemat. Martin enjoyed his Mark Knopfler from the Dire Straits 1983 Alchemy tour placemat even more. The only downside was that since they had some of their favorite things in front of them they didn't want you placing any sort of food or drink on top of them. Additionally this didn't seem to make the perpetual disgusting state of our table and dining area any better. We got some good snow at the end of January which meant lots of time for the guys to explore the frozen wonderland with a lot more flexibility. Last year they could basically only take a few steps and fall over. 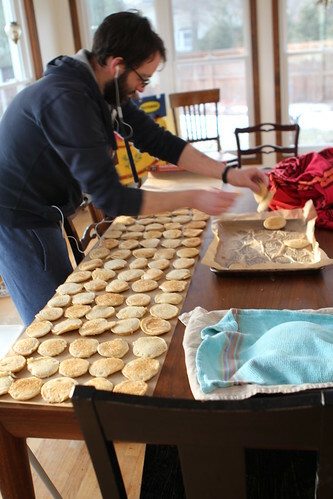 There was so much snow leading up to the Super Bowl that we were snowed in and couldn't have guests over for our annual Super Bowl party. I'd prepared my usual dishes to celebrate the opposing teams' cities but instead we simply watched the Puppy Bowl with the boys. I had never watched this before which means that maybe I had some faint glimmer of hope for America. 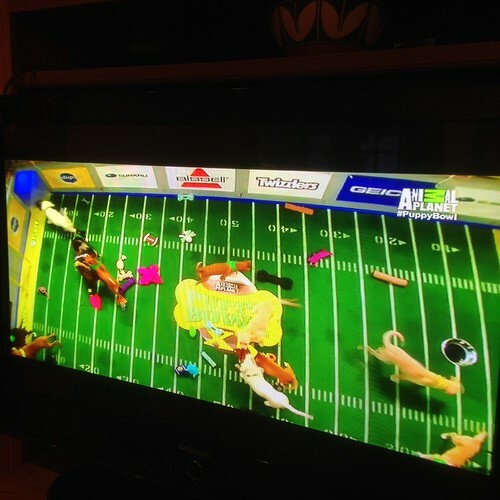 After watching the Puppy Bowl I now know that all is lost. Instead of celebrating Seattle and New England we celebrated Chili's with a big plate of nachos. Soon after we rushed away for a pre-baby spa "weekend." The last time we did this was three years ago when Jen was also pregnant and unable to enjoy alcohol. Someday we'll have to do it when Jen's not pregnant. 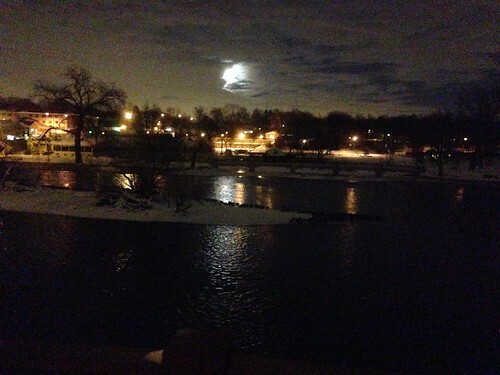 From the window of our beautiful hotel room we had a view of the moonlight annd the river littered with geese. 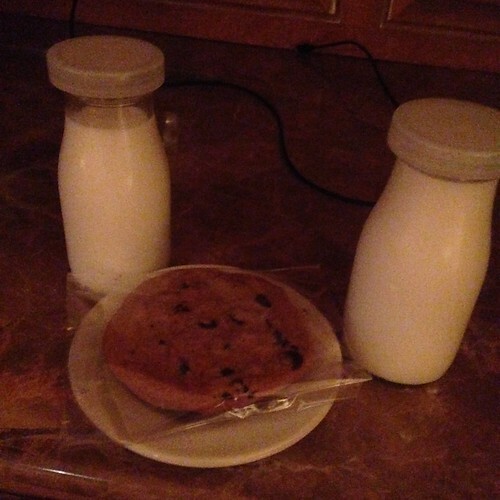 Each night they brought us warm cookies and chilled milk from a local dairy. The idea was so romantic to me that I even tried sipping on some of the milk but was reminded that I still think milk is disgusting. 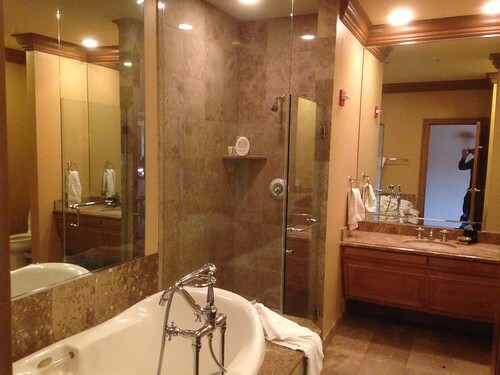 The bathroom in our room was fantastic. It was actually about the same size as our master bathroom at home except laid out in a manner that would lead me to believe it was designed by a human being that has used a bathroom before instead of a blind toddler just randomly dropping blocks using Minecraft. Before returning home we had one last breakfast by the fire, in peace. 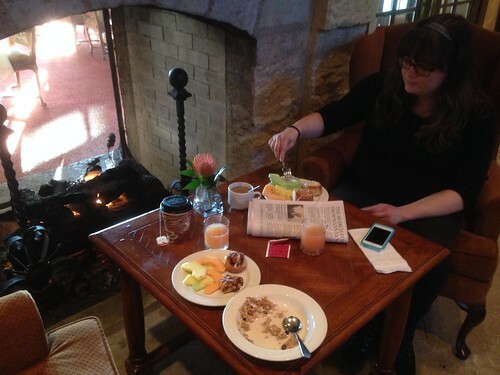 We were missing the boys quite a bit by then but I must admit the luxury of having breakfast by a fire paled in comparison to just being able to have breakfast sitting down. 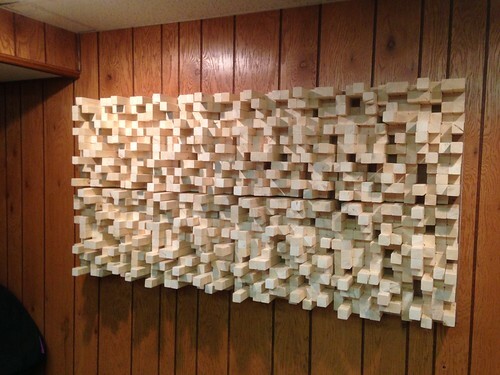 When we returned home Uncle Doug gave me a hand in finally installing the QRD diffusers I'd begun making in November. 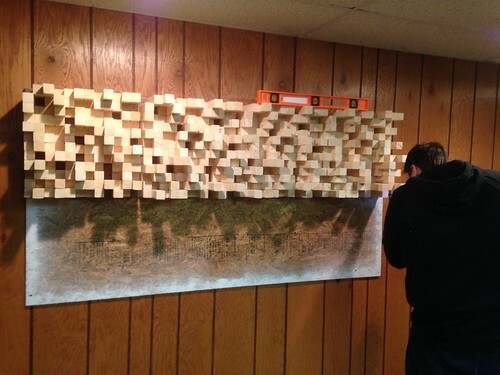 Step by step the basement studio is coming together. I'm sure when Uncle Dee Dee is born I'll have plenty of time to spend in my home studio. Upon returning home we were able to go out into the backyard and play around with the boys in the paths I'd shoveled before leaving. They had fun building a snowman and Martin got to do his second favorite activity in the world: throwing snowballs at me and his mother. His favorite activity: pretending to throw snowballs at us.